“At 7 p.m. on Thursday, Aug. 12, 1965, about 2,000 people gather at 116th and Avalon. Tension is still high after the mob violence of the previous night following the arrest of an alleged drunk driver, but the people are not rioting. 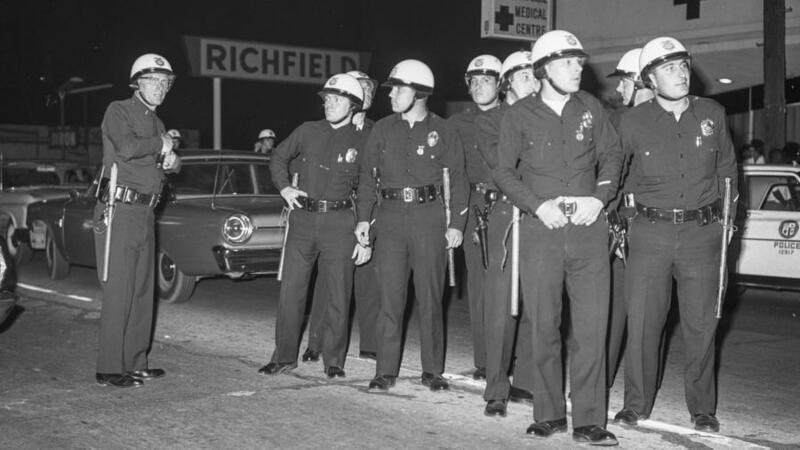 A group of Los Angeles police officers stand together during the Watts riots on Aug. 11, 1965. Joseph Wambaugh, a former LAPD sergeant, is the author of 21 books of fiction and nonfiction about police and crime. He was assigned to Juvenile Division in 1965. This entry was posted in In the News, Non-Fiction and tagged Joseph Wambaugh, Non-Fiction, Watts Riot. Bookmark the permalink.